Search for waterfront lots, homes or cottages for sale on your favourite area lakes. Let Us Help You Find the Perfect Home or Cottage. Georgian Bay has some of the most stunning natural scenery in Canada. From secluded island properties to road accessible waterfront homes, Georgian Bay offers something for everyone. Horseshoe Lake and Virtue Lake are located in Seguin Township south of Parry Sound. One of the area’s larger lakes and a very popular cottage lake within a 2-hour drive of the Greater Toronto Area. Lake Manitouwabing is located in McKellar Township, approximately 20 kilometres northeast of Parry Sound. The largest lake within a 30-minute drive of Parry Sound, it offers a broad range of cottage properties. A popular lake located in Seguin Township just south of Parry Sound. It features a full-service marina, a popular family resort with restaurant, and excellent boating. Located both in McDougall & Whitestone Townships, Lorimer Lake is north of Parry Sound off the Highway 124 corridor. One of the area’s larger lakes popular with boat anglers and cottagers. Lake Joseph is world-renowned for its clean, clear waters, rocky, pine-lined shoreline and some of the most spectacular (and expensive) cottages in Canada. Part of the “Big Three” Muskoka Lakes with access into both Lake Muskoka and Lake Joseph. Some of the oldest cottages in Ontario are located along Lake Rosseau’s picturesque shoreline. The Whitefish Lake and Clear Lake chain of lakes in Seguin Township (including Little Whitefish Lake), is a very popular three-lake system located south of Parry Sound and a 10-minute drive from Rosseau. One of the area’s largest water bodies, Whitestone Lake boasts 70 kilometres of shoreline and is 30 minutes north of Parry Sound. A popular, affordable waterbody offering excellent fishing and boating opportunities. Blackstone Lake and Crane Lake are south of Parry Sound in the Township of the Archipelago. A very popular large lake system with clear waters, great fishing and boating. Can be tough to find road access properties on these lakes. Harris Lake is in McDougall Township, 20 K. north of the Town of Parry Sound. A mid-sized lake that is popular with families looking for easy to affordable, year-round accessible cottages and year-round homes. Lake Wahwashkesh is located in the Whitestone Township off Highway 520, 40 kilometres north of Parry Sound. The largest lake entirely within the District’s boundaries, it offers outstanding fishing and boating opportunities. Mill Lake is a large lake immediately to the east of the Town of Parry Sound. Features a high, rocky bluff along the south end of the lake, it offers boating into Portage Lake and the Mountain Basin area of the Seguin River. Shebeshekong Lake is one of the few mid-sized lakes Carling Township, north-west of Parry Sound off the Highway 529 corridor. Offers an excellent mix of affordable road accessible cottages, good boating and fishing. Star Lake and Turtle Lake are in Seguin Township, approximately 30 kilometres south-east of Parry Sound and 20 minutes from Rosseau. Both are very popular mid-sized lake offering a wide range of affordable, drive-to cottages. McKellar Lake is a mid-sized lake immediately north of the Village of McKellar. With a surface area of 212 acres and a maximum depth of 32 feet, the lake supports good bass and pike fishing. We love affordable lease-hold cottages on Parry Island. A mix of rock and sandy shorelines, road access and only 30 minutes from Parry Sound by car. Healey Lake and Kapikog Lake are in The Township of the Archipelago, approximately 30 minutes south of Parry Sound. Both are popular large lakes offering a wide range of affordable cottages. Lake Manitouwaba (not to be confused with Lake Manitouwabing) is a mid-sized lake in Seguin Township, east of Parry Sound off Highway 518. Offers entry-level and mid-price road accessible cottages. 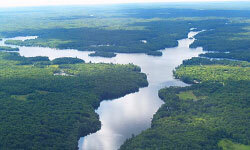 Lake Cecebe and Ahmic Lake are located in the Municipality of Magnetawan, northeast of Parry Sound. Several kilometres of boating exist on this large lake system. Neighick Lake and Crawford Lake have navigable access into the lake system. Go Home Lake is only 90 minutes of Toronto, located in Georgian Bay Township. Cottages on this popular lake are mostly only accessible by boat, the lake is served by two marinas and has great boating and fishing available. Skeleton Lake is a large, deep lake located in Muskoka Lakes Township. Famous for its rugged landscapes, rocky cliffs and crystal clear waters. One of Muskoka’s most popular lakes!